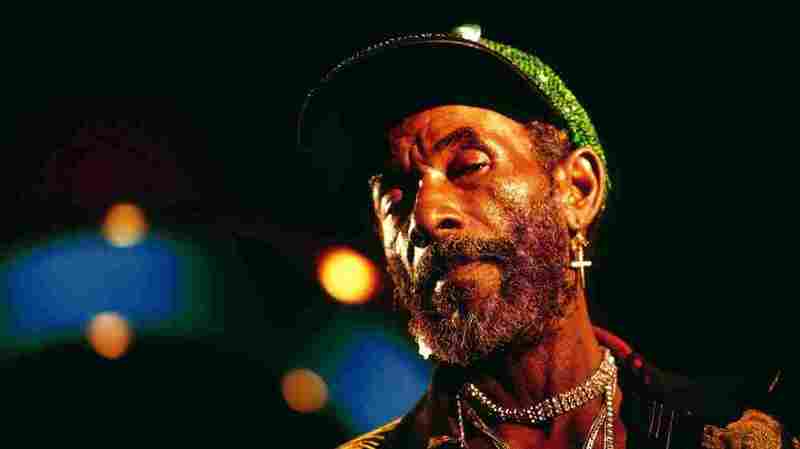 Lee 'Scratch' Perry: Over 75 Years, From Dub To Dubstep : The Record The groundbreaking reggae and dub producer stays relevant: He now influences electronic music. Lee "Scratch" Perry in the mid-1990s. When it comes to the history of reggae, Bob Marley is almost always the main event. This month and next, though, another iconic Jamaican artist gets the spotlight. On the heels of his 75th birthday, singer, songwriter and producer Lee "Scratch" Perry is releasing an album and starring in a documentary called The Upsetter. The film takes a biographical look at the eccentric mastermind behind dozens of classic reggae and dub songs by Gregory Isaacs, The Clash and Bob Marley. He was born Rainford Hugh Perry in rural Jamaica, and moved to Kingston when he grew up. He worked as a handyman and janitor at music studios, then worked his way up to writing songs. Perry launched his own label and released his first single in 1968. "People Funny Boy" was one of the first songs to use a sample, as well as one of the earliest reggae songs. By the '70s, he was producing some 20 songs a week for hundreds of artists at his famous studio in Jamaica, the Black Ark. There, Perry pioneered dub music, using the mixing desk as an instrument to re-create new versions of songs. In one example, Perry reworked Max Romeo's "I Chase the Devil" (a song that Perry himself produced) into a stripped-down dub classic, "Disco Devil." Perry's dub sound continues to influence music today, especially in the electronic sphere. Below is a list of classically influenced dubstep tracks, curated by Owen Renn, an Atlanta-based DJ working with Embassy Recordings and the Atlanta Dubstep collective. When examining who bridges the gap between the classical sounds of dub reggae and modern club music, Digital Mystikz member Mala is at the top of the list. Music built for powerful soundsystems and dancehalls, it's the pure essence of "dub" as understood by pioneers like Lee Perry. The influence here is unmistakable, as RSD gives us a rhythm with an emphasis on kick and tambourine interplay. The track's melodic elements come from an unmistakably classic dub guitar strumming, and arrive complete with MC calls and effects. Lee Perry v. Kode9 - "Yellow Tongue"
A limited- edition vinyl release from Kode9, featuring the vocals of Lee Perry on top of a quintessential Kode9 backing track. A hidden gem to many, but an absolute classic. The opening track from Tectonic's classical dub-influenced compilation release Scientist Launches Dubstep Into Outer Space. Pinch's productions have always been highlighted by complex polyrhythms and menacing bass sounds. The meandering, echoed vocals from Emika here add another element that recalls the use of effect-laden vocals in dub reggae. This track opens a compilation in which dubstep pays homage to classic dub, so its inclusion is essential.